Welcome to the January edition of the Digital Forensics Magazine Newsletter. The team at DFMag hope you all had a fantastic holiday season and wish you all the best for 2013. This month, we bring you the latest news, information on events this year and all the details of what's coming up in Issue 14, due out 1st February. Nuix has announced the release of version 4.2 of its eDiscovery software. This substantial upgrade delivers powerful new capabilities for eDiscovery practitioners including an open and defensible predictive coding engine, as well as manual and automated, keyword-based redaction of sensitive information. "This release builds on our core strength of indexing, searching and managing huge volumes of unstructured data faster and more reliably than any other available technology," said Stephen Stewart, Chief Technology Officer at Nuix. Nuix's predictive coding technology uses open, proven textual analysis techniques that are easy to understand, use and explain. Nuix 4.2 includes the ability to create redaction mark-ups for each production set, reducing the risk of releasing privileged or sensitive information. Legal teams can create mark-ups manually or automatically redact text based on a word list. The ussc.gov website has been offline intermittently, ostensibly due to high traffic. Anonymous Operation Last Resort tweeted the Asteroids hack can be "played" on yet another U.S. government website: "Backup gaming site while USSC.gov is down miep.uscourts.gov " (the U.S. Probation Office for the state of Michigan). This suggests, in this writer's opinion, that Anonymous has background control of multiple U.S. government websites - and after the antics this weekend, the group likely has had this access for a while and they are playing a game of cat-and-mouse with the United States Department of Justice. The Pentagon will dramatically increase its cyber-security staff to counter threats against US government computer networks, according to media reports. US Cyber Command, established three years ago, could grow as much as fivefold over the next few years. The planned expansion comes amid a series of successful attacks, including a virus that wiped data from 30,000 computers at a Saudi oil firm. Defence officials told the Washington Post, which first reported the staff increase, that the Pentagon had approved an expansion to 4,900 troops and civilians. Another official told Reuters news agency that the force would be expanded significantly, though details were still being worked out. The expansion comes at a time when the US military is balancing decreased budgets and a shift towards Asia and the Pacific. According to reports, the plan calls for creating three types of forces under the Cyber Command: protecting computer systems that involve electrical grids and other kinds of infrastructure, offensive operations overseas as well as protection of the defence department's internal systems. Digital Forensics Magazine is proud to be partnering with the Forensics Europe Expo, hosted in London, this April. 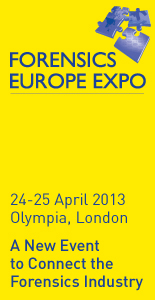 FREE Visitor Registration is now live for Forensics Europe Expo, 24&hyphen;25 April 2013, Olympia, London. This is a must attend event for any police or law enforcement professional involved in the forensic analysis of evidence and criminal prosecution. The closure of the Forensic Science Service in March 2012 has forced the forensic landscape to evolve into an "Open Market." There is now, more than ever, a need to understand new legislation, and the impact and future challenges it will have on the availability, procurement and supply of forensic analysis & products and the future challenges facing the market. A free to attend exhibition with 70+ exhibitors and a product demonstration led workshop programme will run alongside dedicated 2-day Forensic Innovation and Digital Forensics conference streams. All Digital Forensic Magazine readers will receive a 20% discount off the conference by using code DISC20 at the registration checkout. /Issue 14 of Digital Forensics Magazine Out February 1st! Issue 14 is due out 1st February 2013 and promises to be one of our best issues to date. 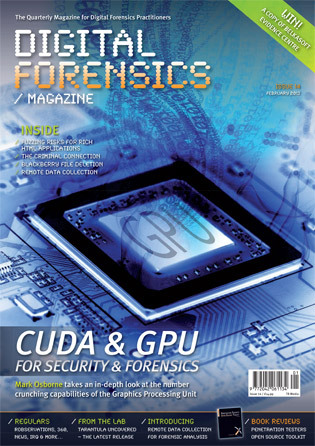 Our feature article comes from well known Forensic and Security pratitioner, Mark Osborne, and discusses GPU and CUDA. Yuval Ben-Moshe discusses how the use of mobile forensics can help combat the threat of organised crime. By exploring the way in which technology is advancing, we can predict how criminals will operate. Mark Osborned explores the opportunities that CUDA holds for revolutionizing information security. He explains how the use of GPU and CUDA could lead to a world of hardware assist security. In this article Brian Cusak and Muteb Alqahtani describe how modern commerical web applications are vulnerable to attack via threat vectors that involve the use of fuzzing, especially where rich HTML is used, that operate much life a desktop operating system. BlackBerry devices are not typically welcome arrivals within a forensic lab; their robust security often making examination diffi cult. In this article Kevin Mansell looks at some interesting aspects of the FAT implementation used in BlackBerry devices, and how thumbnail caches can provide a valuable source of evidence. In the May/June 2012 issue of Digital Forensics, we discussed the inherent challenges posed by Chinese mobile device chipsets to forensic professionals. We also introduced Tarantula, an advanced mobile forensics system, including hardware and software, which is specifi cally designed to analyse devices with these chips. In this article, Kevin North takes a closer look at Tarantula and explain the analysis process. We will also present some features of Tarantula�s latest release. Michael Taylor observes how UC vulnerability loopholes need management strategies to minimise fraud and explains how Emerging Comprehensive Unified Communication Risk Management (CUCRM) solutions reduce UC fraud while maintaining realistic ownership costs. In this article using a particular case study Tom Turner looks at how a Remote Governance and Collections platform (RGC) was developed as a proof of concept and can be used to manage and forensically collect data, saving investigators (and their clients) both money and time. An Ethical Hackers view on the dangers of mobile malware and how to stop it.